John Muir founder of the American National Parks system was born in Dunbar in 1838. HE DUNBAR GOLF COURSE is laid out on the land where Oliver Cromwell's army camped prior to the Battle of Dunbar in 1650. 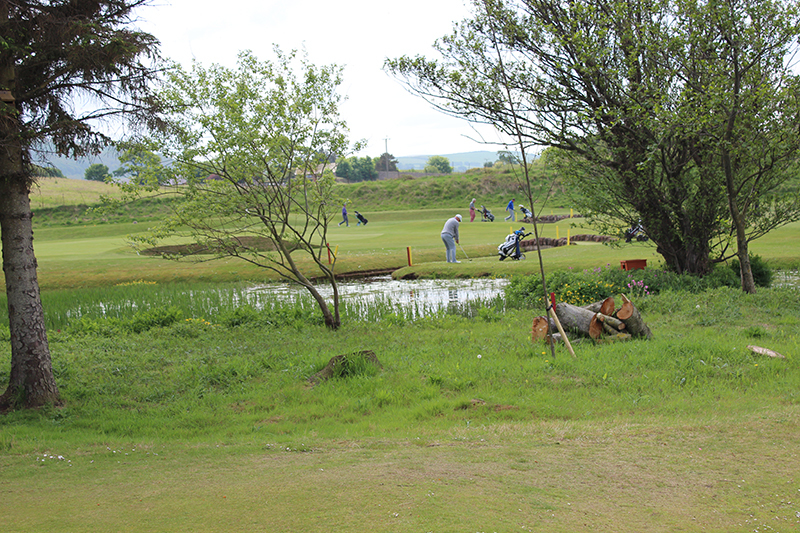 It is known that golf was played in the Dunbar area at least as early as the beginning of the 17th century. Records reveal that a hundred years before Bonnie Prince Charlie was defeated at Culloden, the assistant Minister at Dunbar was disgraced for playing at gouff. It is also documented a quarter of a century earlier that two men from the neighbouring parish of Tyninghame were censured by the Kirk Session for playing gouff on the Lord's Day in 1616. In 1794, a group of gentlemen with strong masonic ties formed Dunbar Golfing Society which played at Westbarns but support declined over the years. The only remaining documents from that Society are the Rules and Regulations dated 14th May 1794. Following a meeting in the Town Hall, Dunbar Golf Club was founded and the first meeting was held on Saturday 20th December 1856 on a course laid out on the Duke of Roxburghe's estate. Exhibition matches were popular and the 'sporting press' of the day reported that Tom Morris and Andrew Strath took on and beat the Park brothers after the Autumn Meeting at St Andrews in 1863 and one week later, Tom beat Willie Park for an 'undisclosed' sum at Dunbar. The original course was 15 holes before it was redesigned by Tom Morris in 1894 when he extended the course and altered seven holes. He was considered to be the first golf architect, charging one pound sterling per day plus travelling expenses. Many of our great courses were laid out by Tom Morris, including the scene of his Open triumphs at Prestwick and Muirfield. In 1905 Ben Sayers was invited to give advice on a major extension of the course to 5,740 yards which included Deer Park for the first time. Ben Sayers was also involved in an extension in 1923. The artisan Dunbar Castle Golf Club was established at a meeting in the Railway Hotel on 3rd August 1882. The first clubhouse was opened in June 1871 known as 'Golf House' which is now a private residence named 'Beachcote' situated on the road leading to the golf course. The present clubhouse was constructed in 1902 with oil lighting. The Dunbar Ladies Golf Club was instituted in the Mason's Hall in 1894. Originally the ladies competitions were played over 12 holes, using the first six and last six of the 18 hole course. This was followed by a letter from a young Edinburgh lady, coming to Dunbar for a holiday, intimating she would be a competitor and hoped that she might be considered. Over the years the Dunbar Ladies Golf Club has hosted the Scottish Ladies Championship, British Girls and Scottish Girls Tournament. Dunbar East Links, situated on the estuary of the Firth of Forth, is a combination of links and inland turf, laid out on a narrow stretch of land which follows the natural contours of the coastline. The main features include the Old Deer Park wall running the length of the course, Barns Ness lighthouse at the 9th, the ruined building known as 'The Vaults' at the 14th, and a number of square shaped greens. The 9th through 12th are the most testing holes but the closing stretch with the rocky beach ready to accept the mildest of slices can also ruin a good score. The first reference to Hedderwick Hill as a golf course was in 1890 when the Honourable Company of Edinburgh Golfers were looking for another location due to over crowding at Musselburgh. The Honourable Company decided to move to the site of another race course at Muirfield. Hedderwick Hill was also known as West Barns links where Dunbar Golfing Society played their golf. St.Clare Cunningham who leased Hedderwick Hill farm from landowner the Earl of Haddington, laid out a nine-hole golf course in 1897. The course was extended to 18-holes in 1901. In September 1912 James Braid went round the course at Hedderwick in 57 stokes. The amateur record held by Robertson Dunham was 64. With the increase in popularity of golf, the Cunningham family laid out a new course on Winterfield farm opened in 1934. The land at Hedderick was commandeered by the military prior to WW2 and the course closed in May 1937. The ground at Winterfield was offered for sale and was purchased by Dunbar Town Council in 1935 as a municipal golf course. With local authority regionalisation in 1975 the ownership of Winterfield transferred to East Lothian District Council. In 1960 the Duke of Roxburghe sold the Dunbar golf course to Portland Cement Co. and the ownership then transferred to Lafarge Cement Co. in 2001. East Linton Golf Club was founded in 1903 and the members played over Hedderwick Hill golf course. The fourth baronet Sir Archibald Buchan Hepburn of Smeaton was a great supporter of the local curling and golf societies. In 1937 the green-keeper was W. Kerr. The club disbanded during World War Two and following the armistice the club was reinstated. Today the members of East Linton Golf Club play their matches at Dunbar Golf Club and the present membership is restricted to Dunbar members who live in and around East Linton. Dunbar was also the location of one of Scotland's historic racecourses. In 1871 the East Lothian and Scottish Yeomanry staged a Flat race meeting at Belhaven. The most success trainer at Dunbar was George Boyd whose stables were at Tilton House, Westbarns. One of the main supporters was the land owner St Clair Cunningham at Hedderwick Hall until his death in 1906 when the racecourse closed at Belhaven. The first clubmaker to be attached to Dunbar Golf Club was Alexander Manderson, a joiner to trade who also made golf clubs and balls from his premises at 1 High Street, Dunbar. He was followed by Alexander C. Brown from Musselburgh who was appointed greenkeeper and professional in 1881. He was engaged at £25 a year, and resided rent-free in the Golf House. He was later personal resident golf instructor to Sir David Kinloch at Gilmerton House, Athelstaneford. Alex and his wife Mary resided next to Willie and Susan Park Jnr in Musselburgh and Alex’s father was a pig dealer. A. C. Brown was appointed professional at Nairn Golf Club (1888-1890), before moving to Granton-on-Spey Golf Club (1890-94) where he laid out the nine-hole course. A. C. Brown laid out the Forres Golf Course in 1889. He moved to Callander Golf Club (1894-1902). Andrew Sommerville was professional (1891-94), then J. & D. Clark club and ball makers from Musselburgh (1894-99), before Tommy Currie foreman with J.& A. Dickson, Edinburgh was clubmaker (1899-1902). Robert Auld was appointed (1902-39) and the first head greenkeeper was James Gellatly (1894-1901). Followed by Willie Robertson and then Robert Auld as professional and clubmaster in May 1902. Henry Anderson was appointed the first green-keeper and professional at Winterfield Golf Club Limited in 1934. The following year the ground was purchased by Dunbar Town Council and the Burgh municipal course was open to the public. Henry James Anderson born 9 September 1903 in Gullane, son of William Anderson, a slater and his wife Christina Wilson. Henry and his wife Janet McCulloch resided at 3 West Port Dunbar. He was followed at Winterfield by Andrew Dishington who later moved to Dunbar Golf Club. Robert Auld, born 23rd March 1871, 7 High Street, Fisherow, Musselburgh, son of William Auld, lamplighter and his wife Mary Logan. Robert Auld was appointed Professional and Clubmaster at Dunbar G.C in May 1902 and remained there until he retired in 1938. Auld apprenticed as a clubmaker with James Hutchison at North Berwick and was a scratch medallist of Bass Rock Golf Club. At the time the resident club-makers at Dunbar was J & A. Dickson club cancelled their contract. The committee asked Ben Sayers, Laurie Auchterlonie, James H.Hutchison and Willie Park to suggest a replacement and Hutchison recommended Robert Auld. He worked from 142 High Street, Dunbar and some fine examples of his clubmaking still exist, stamped with Rt Auld. He married Annie Barr and their son William Auld was later assistant at Dunbar before being employed as a clubmaker with Ben Sayers Ltd. Robert Auld donated the prizes at the annual Dunbar Castle Golf Club outing to Muirfield. Adam Gullen (below) apprenticed as a clubmaker under Robert Auld at Dunbar before he emigrated to America in 1915 and was appointed professional to the National Links of America, Southampton, Long Island. David Lumsden Cairns born 13 July 1901 at 3 Old Harbour, Dunbar, son of George L Cairns. David attended East Barns Primary School and then Dunbar Grammar school, before he was employed as a licensed caddie on the East links. He was also a talented golfer and was encouraged to emigrate to America by Jimmy Lindsay head golf professional at Oak Park Country Club, Chicago. Lindsay's parents resided in the East Lodge, Broxmouth Estate, Dunbar and Dave Cairns followed Tom Dickson from North Berwick as assistant professional to Jimmy Lindsay at Oak Park, Illinios. In 1914, Jimmy Lindsay visited his family in Scotland and shared the return journey to America on the S.S. Cameronia with Adam Gullen who resided in Woodbush House, Dunbar. On 16th March 1915 the New York Times reported that Gullen recently arrived from Scotland was appointed professional to the National Golf Links of America, Southhampton, Long Island. William B. Ames a founder member of Brookwood Country Club, Chicago persuaded Dave Cairns to join his club as its first professional in 1924. During the winter months Cairns organised an indoor golf school in the Oak Park Y.M.C.A. He was professional at Brookwood Country Club for eleven years. In 1934, Dave with his wife Margaret Wilson and daughter Betty Ann returned to Scotland on holiday for two months. They were joined on the trip by Alan Brodie and his wife. Alan was a native of North Berwick and head pro at Lakewood Country Club, Richmond, Virginia. Brookwood was sold in 1998 and renamed Maple Meadows Country Club, Wood Dale, Illinios. David Cairns was among twelve local professionals who represented the Illinois Section of the PGA and gave free golf lessons in the Columbus Park Indoor Golf School, sponsored by The Chicago Tribune since 1932. J & D. Clark based in Musselburgh since 1892 were the resident clubmakers in Dunbar working from a workshop behind the Golf House (Beachcote). J & D. Clark produced golf clubs and balls for the wholesale and export market from their workshop at 2 Eskside South, Musselburgh and in 1896 they were the largest golf equipment manufacturer in Scotland, employing over 40 men. They opened branches at 16 Braid Road, Edinburgh and Dunbar. Their best seller was the 'Musselburgh' gutty percha ball and in 1898 they exported over 107,000 to the USA alone. In 1899 the J & D. Clark contract at Dunbar Golf Club was taken over by J & A. Dickson of Edinburgh. 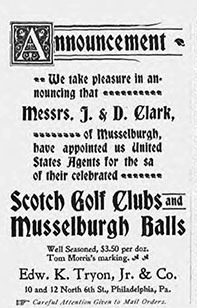 In 1898 J.& D.Clark appointed Messers Edward K. Troon Jr. & Co. Philadelphia as their agents in America. J & D. Clark failed to bring out a rubber-core ball which was increasing in popularity about the time they gave up the ballmaking and closed the business in 1903. Two of the Clark brothers emigrated to America, David was a professional in Pennsylvania, Peter Clark worked in Westchester County in New York and was attached to Springhaven Golf Club PA. and James Clark was assistant to J.H. Taylor at Mid-Surrey Golf Club. J & A Dickson from Edinburgh took over the clubmaking at Dunbar but the club cancelled their contract. Advert on the left was published in Golf Bulletin - January 1898. Thomas Denholm Currie, born 1878 in Colinsburgh, Fife, son of George Currie, blacksmith (employing 3 men and 1 boy), and his wife Janet Lumsden. Tom apprenticed as a clubmaker with A. H. Scott at Elie. In 1897 he was appointed foreman club and ball maker with J & D Clark 16 Braid Street, Edinburgh and Golf House, Dunbar. The company was famous for their 'Musselburgh Ball'. In 1899 J & A Dickson took over the workshop in Dunbar and Tommy continued as foreman and was joined by his younger brother George Currie. Tom married local girl Wilhelmina Paxton and was appointed golf professional and clubmaker at Headingly Golf Club (1904-06). He then moved to Royal Dornoch Golf Club where he remained for sixteen years. (1906-1922). The other clubmakers at Dornoch were Donald MacKay and Bob McDonald who moved to North Berwick in 1904 and then to America. Clubs stamped 'T D Currie, Maker, Dornoch' are very rare. Tommy lived with his family in Links Cottage, and was joined at Royal Dornoch by his brother George Currie and who became a PGA member in 1903. In 1904, George was appointed assistant to James Braid at Romford Golf Club. Tom emigrated to America sailing from Southampton on S.S. Aquitania he arrived in New York on 11th November 1921. His contact in America was Donald J. Ross from Dornoch who was by then making his reputation as a golf course architect. Tommy resided with Donald J. Ross at 1032, Beacon Street, Boston and the following year he was appointed professional at the Ross designed course at Inverness Country Club, Toledo, Ohio. That year he played J.H. Taylor in an exhibition match at Inverness. In April 1922, Tommy was joined by his wife, sister and younger brother Douglas Currie from Dunbar and they lived at 325, Kevin Place, Toledo, Ohio. In February 1922 Tommy was joined by George Currie who accepted a position at Portage Country Club, Ohio. In 1931 he moved to Knollwood Golf Club, Lake Forest, Illinois. Thomas D. Currie died in 1951 and is buried in Hazel Ridge Cemetery, Wisconsin. Robert Dickson born 22nd April 1865 at 8 Harbour Terrace, North Berwick son of Alexander Dickson, fisherman and his wife Mary Ann Kelly. 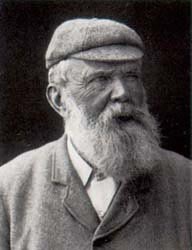 In 1900 Bob Dickson was appointed head greenkeeper at North Berwick with Robert Johnstone Snr. and Robert Kelly as his assistants. Dickson left in April 1902 and moved to Dollar Golf Club before being appointed head greenkeeper at Dunbar Golf Club in August 1906. His reference for the position of greenkeeper was supplied by Jack White from North Berwick, the pro at Sunningdale and Hugh Hamilton who Dickson had worked with at North Berwick. Hamilton followed Tom Morris as custodian of the links at St Andrews in 1903. Dickson’s wife was appointed stewardess in the new clubhouse. In 1906, Dickson laid out the new 17th green (present 2nd) which is all that remains from his tenure at Dunbar. Dickson moved to Headingley Golf Club in Leeds in 1909 and resided with his wife Sophia Robertson and daughters in Park View, Adel, Leeds. The following year Jock L. Hutchison from North Berwick was appointed head professional at Headingley which must have been more than just a coincidence. Robert Fairbarin born 29th July 1881, 74 High Street, Dunbar son of Robert Fairbairn carter and his wife Flora Fergusson. In 1900, Bob Fairbarin was working as a blacksmith and resided at 4 Writers Court, Dunbar. Like many of the teenagers they learned to play golf as a member of the artisan Dunbar Castle Golf Club. Bob emigrated to America, sailing from Glasgow on the S.S.Caledonia he arrived in New York 27th March 1911. Bob shared the journey with Bob Findlay the assistant professional at Dunbar. James Gellatly was a greenkeeper at Dunbar Golf Club (1893-1901) and was born in 1851 at Alyth, Perthsire. Gellatly was paid one guinea per week, given a free house, and four tons of coal. He was also paid five per cent on sums collected from strangers playing on the green and five shillings from each member whose clubs he kept in order. Adam Gullen born 1885, 50 Dawell Brae, Dunbar son of Adam Gullen Sr. potato worker and his wife Alison Gullen. Adam Gullen Jr. apprenticed as a golf clubmaker with Robert Auld at Dunbar Golf Club. He moved with his parents to Woodbush House, Dunbar and in 1915 he emigrated to America. According to the PGA Gullen was appointed professional to the National Golf Links of America, Southampton, Long Island NY. He shared the journey to New York with Jimmy Lindsay from Dunbar who was golf professional at Oneonta Country Club, NY and they arrived on 6th March 1915. Adam Gullen was probably recommended for the position of head professional by Peter W. Lees from Archerfield Golf Course who carried out the landscape work to C.B. Macdonald's design at the National Golf Links. It was reported that Adam Gullen died suddenly on 24th April 1915 at Southampton, (NY). James Lees Hastie born 22 December 1882, 9 Custom House Square, Dunbar son of Walter Hastie, harbourmaster and pilot and his wife Janet Lees. On leaving Dunbar School Hastie apprenticed as a clubmaker with Tommy Currie, foreman of J. & A. Dickson in Dunbar. Hastie played left-handed and was a member of Dunbar Castle Golf Club and his name is engraved on many club medals. Hastie joined his cousin James H Kerr at the Gezira Sporting Club in Cairo, Egypt before joining the Khedive Sporting Club (1902-1925). Later the name was altered to Gezira Sporting Club which included Cairo Golf Club. The young Hastie was described as a prodigy of Sir Reginald Wingate governor-general of the Anglo-Egyptian Sudan who retired to Dunbar and was a keen golfer. It was Wingate who encouraged Hastie to take up the position in Egypt. Sir Reginald Wingate died in January 1953 and is buried in Dunbar Parish Church. Windgate Terrace, Dunbar is named after him which is close to Knockenhair where he lived. In 1906 Hastie returned home to visit his family and entered the Open Championship at Muirfield. In 1912, Hastie played an exhibition match with Ben Nicholls, a professional from Seaford, Sussex which the Englishman won. Ben Nicholls was a professional in Philadelphia and played with Willie Anderson four-times US Open winner from North Berwick. In 1925 John G Kerr joined his brother in Egypt and was appointed assistant-pro at Gezira, where he won the Egyptian Open Championship in 1926. The Kerr brothers played golf with the Prince Of Wales during his visit in 1928 and taught King Fuad of Egypt to play the game. The Gezira Sporting Club was as famous as Royal Bombay or Oahu Golf Club in Hawaii and was located on Government property on Gezira Island in the River Nile near downtown Cairo. The Sporting Club had two golf courses in the shadow of the pyramids, a racetrack, polo fields, tennis courts and a football pitch. The course was laid out with sand greens and the golfer had to wear flat-soled shoes. During James H Kerr 30 years with the club he converted the greens to grass and introduced irrigation. In the 1930s, Cairo became the central hub for Imperial Airways as a stop-over for British tourists flying to Nairobi, Johannesburg, Delhi and Singapore. The Sunderland flying boats created a spectacular and graceful sight as they landed on the Nile. The visitors stayed in the worlds most exclusive hotels in Cairo and partied in the most fashionable night clubs and casinos. In April 1932 the first commercial flights from London to South Africa commenced and during the two day stop-over in Cairo the high flyers would play golf and other sports in facilities created to feel like 'Little England'. James L. Hastie died in Egypt in 1930, aged 48 years. Clubs stamped with a five point star and J. Hastie Cairo (Egypt) are very rare and highly collectable. Walter Bruce Heatly, born 5th August 1900 at 33 High Street Dunbar, son of Peter Heatly, a tailor and his wife Jane Paterson. In 1923 he sailed to America on S.S.Cameronia and was accompanied on the journey by Frank Hobens from North Berwick and James Langlands from Gullane. Bruce Heatly joined Robert Fortune the golf pro at Conneaut Country Club, Ohio. Robert 'Bob' Fortune's family lived in Haddington Place, Aberlady and he had emigrated the previous year. Bruce Heatly was appointed golf pro at Echo Lake Country Club, Westfield NJ 1925-26, where he was joined by his brother John Heatly in 1925. Bruce moved to Whitehall, New York in 1928. In 2015 Alan Martin the former assistant at Dunbar was appointed to the Angkor Golf Resort in the Siem Reap district of Cambodia. Originally from Eyemouth, Martin served his time as a PGA trainee under Jacky Montgomerie at Dunbar. For the past five years Martin was head assistant pro at The Dukes course at St Andrews. Siem Reap is a popular tourist destination and as head pro Alan will be involved in developing a new purpose-built golf academy operated by the Kohler Company his employers in St Andrews. James George Pettigrew born July 1932 in Dunbar son of James R. Pettigrew, shoemaker and his wife Agnes Lumsden. In 1949, Jim Pettigrew emigrated to America and joined his uncle David L Cairns at Elmhust Country Club situated between Grace Road and Alexander Boulevard in Addison, Illinois. The name was altered to Oak Meadows Golf Club in 1986. Pettigrew also gave lessons at Old Wayne Golf Club, West Chicago. During the winter Pettigrew moved south and was a golf instructor in Florida where he resided at 946, SW 35th Ct, Boynton Beach. He returned to Scotland permanently in the 1970s and joined Dunbar Golf Club. Jim Pettigrew died 15th January 1988 at Tyne & Wear, Newcastle-Upon-Tyne. Jimmy Scott, greenkeeper at Dunbar Golf Club emigrated to Australia in 1924 and was appointed course superintendent at Sorrento Golf Club in Victoria. The original nine-hole course was laid out by Jack and Alex McLaren from North Berwick, who were at that time the professionals at Royal Melbourne Golf Club. When Jimmy Scott arrived in Sorrento the club had commissioned J. D. A. Scott to extend the course to 18 holes. According to an article in the Sporting Globe (Melbourne) the course architect attempted to provide a championship course, but anything over-pretentious was not desired and the Englishman’s plans were drastically modified. J. D. A. Scott resigned from the club in March 1927 and the greenkeeper Jimmy Scott created the present course, opened in January 1930. The McLaren twins were the first professionals to be connected to the club. Sorrento and Portsea were popular holiday resorts where the first European settlers and convicts came ashore in Victoria. Andrew Sommerville was the first professional and clubmaker to be appointed to Dunbar Golf Club. Sommerville was born in 1860 in Prestwick and served an apprenticeship as a clubmaker with Charles Hunter. He was appointed to Dumbarton Golf Club before moving to the Golf House, Dunbar in 1891 with his wife Janet and daughter Mary. In 1893 he was engaged as greenkeeper and professional at the City of Newcastle Golf Club on the Town Moor site, before moving to Ardeer Golf Club in 1901-07. Sommerville emigrated to America in 1911 and was appointed head professional at Exmoor Country Club, Highland Park, Illinois. His contact at Exmoor was the course superintendent William H. Stupple. Sommerville and his family resided at 214 Vine Avenue, Highland Park. The Dunbar course measures 6426 yards S.S.S. 71 and has hosted many tournaments including the PGA Championship, Scottish PGA and Scottish Amateur tournaments. The Ladies Home Internationals and British Ladies Championship, the British Boys and Scottish Boys. 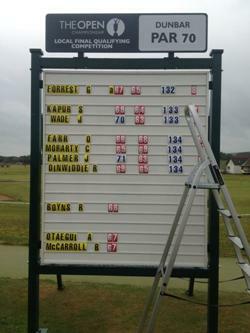 Among the previous winners of the Scottish Boys' was Ewan Murray (1971) and Andrew Coltart (1987). For many years Dunbar was one of the final qualifying courses when the Open Championship was played at Muirfield. In 2002 Steve Elkington qualified at Dunbar and reached the four-man play-off in the final. Luke Donald also qualified at Dunbar that year, plus Esteban Toledo who became the first Mexican to win on the Champions Tour in 2013. Those who failed to qualify at Dunbar in 2002 were Graeme McDowell and Louis Oosthuizen. Copyright © Douglas C. Seaton 1994 - 2019, All Rights Reserved.